A knitted hem offers the advantage of full elasticity to a polished garment edge without pulling it in toward the body. Knitting hems is easy and is similar to creating cords to add decorative touches to your work. 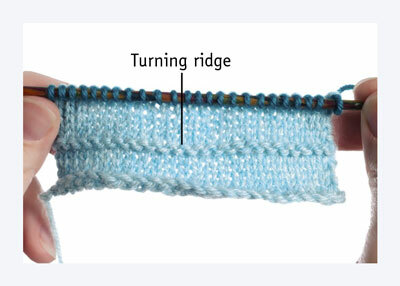 A knitted hem has three parts: the facing, a turning ridge, and the actual hem. 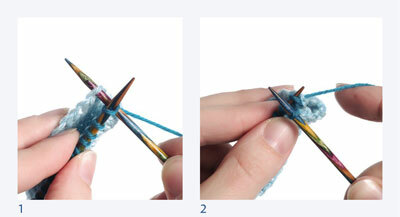 On the last row of the hem, you pick up a loop from the knitted cast-on and knit through it. 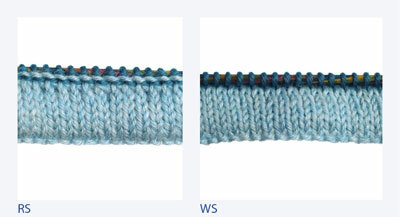 After folding hem to WS, place right needle through first st, then through first loop of knitted CO.
Wrap working yarn, then pull new st through the old one and the CO loop. Rep steps 1 and 2 without skipping any sts or CO loops. Check right side of work often to make sure hem isn’t slanting from having missed a CO loop. Working the joining row with a needle one size larger than that used for the main body of the work helps avoid an unsightly “fold line” from forming on the right side of the work. Sometimes referred to as I-cord (“idiot cord”), knitted cord is one of the most versatile items you can knit. Use it for ties, straps, appliqués, or edges. Using DPN, CO required number of sts. Knitted cord can be worked in any gauge and with any number of sts, depending on the thickness or fineness of the cord required. This example uses 5 sts. Knit all sts. At end of row, rather than turning work, slide knitted sts to opposite end of needle, draw working yarn across back of work snugly, and then knit all the sts again. Cont knitting and sliding until you have made the length of cord you need. Break working yarn and thread through tapestry needle. Thread yarn tail through all live sts and pull snugly to close. Pull tail through inside of cord to hide it.